T-Mobile handset leaks are all coming out from hiding today, as we hear of yet another rumored phone to be on its way to T-Mo retail stores very soon. We’ve already heard about the unconfirmed ZTE handset as well as the Kyocera Hydro Life. But another – which has been popping up here and there for the past few weeks – is the Samsung Galaxy Avant, and it’s one we’ve been intrigued by for a while. 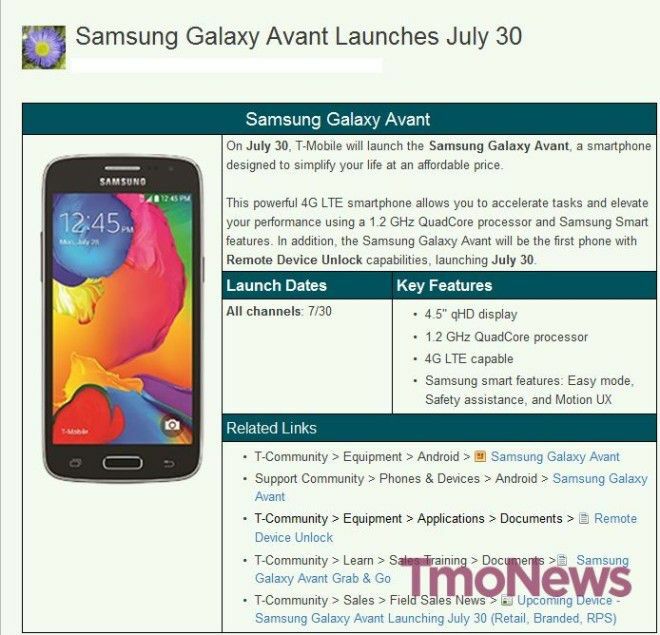 T-Mobile is adding another Android device, the Samsung Galaxy Avant, to our device line up onJuly 30! This powerful 4G LTE smartphone has been designed to simplify customers’ lives at an affordable price. The Samsung Galaxy Avant was designed for performance with a 1.2 GHz Quad Core processory and Samsung smart features, such as Easy Mode, Safety Assistance and Motion UX. In addition, the Samsung Galaxy Avant will be the first phone with Remote Device Unlock capabilities, launching July 30. What’s interesting here is the “Remote Device Unlock” feature. It’s something we’ve been hearing about since a test unit of the Galaxy Avant was shown to us a little while back. As much as we hoped it would happen, we were skeptical at the time that it would ever make a public release. But following information we’ve been sent today, we’re more certain that T-Mobile is planning to launch an easier way for customers to unlock their devices than we were previously. We detailed the process just a short while ago and it seems an app is loaded on to the phone and will enable the user to either unlock their phone permanently or temporarily. If so, launching the app and service on a non-flagship device would give T-Mobile the time to see how popular it might be if rolled out on a larger scale and also give time to work on any potential bugs and fix them. The Galaxy Avant is also likely to be the first smartphone released that’s compatible with T-Mobile’s upcoming 700MHz spectrum. We’re expecting it to launch online and in retail stores, and through all channels on the same day. ← T-Mobile handset unlocking app on its way? I hope so, i want a new phone bad.. prepaid area for me.. but sadly i cant get my self to buy off ebay or craigs, or even amazon cause the phones on those channels have a high risk of getting blacklisted on.. and im tired of my LG L9… its just time for something new..
Qhd for this device likely means 960×540. The galaxy s5 screens resolution is 1920×1080. This phone is what is called quarter HD. 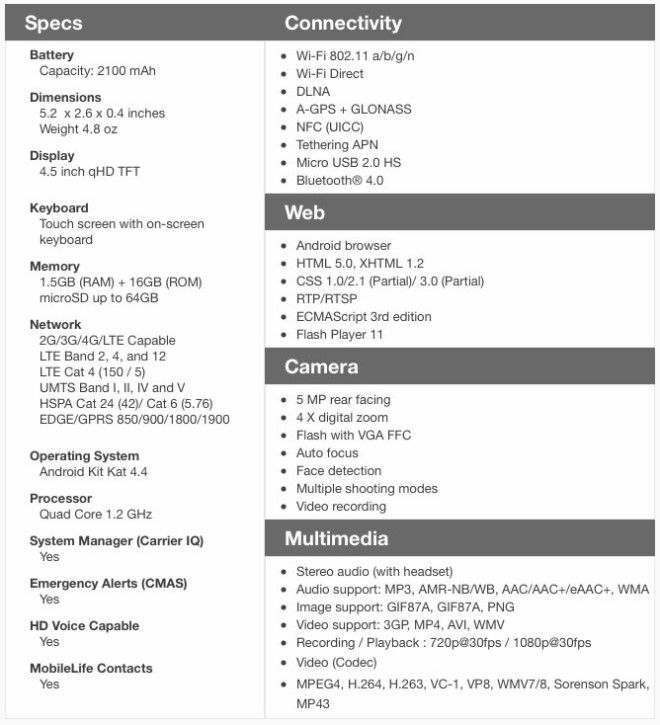 The LG g3 is quad HD. They both have the initials qHD. I completely agree. I think it just causes confusion. You’re not alone either. There are other people out there who think the same thing. It could just be a marketing ploy. Im pretty sure the note 4 will have it. I honestly cannot believe they did not put it in the galaxy s5. that’s why I did not upgrade from my s4 and s5 because there really wasn’t anything worth upgrading for in my opinion. But not everyone will see it that way and that’s fine and that’s their choice. The average person will get confused. I’d be much less surprised to learn that Samsung is using qHD to mean “quarter HD” (or 960×540) and QHD to mean “Quad HD” (or 2560×1440, like everyone else) just to trick people into thinking the phone has a better display. I can’t tell if you’re being serious or not, but qHD is 960×540. QHD is 2560×1400. This phone is definitely low-end. With the new Samsung Galaxy coming out I better sell my old Samsung before the value of it drops. I usually search 1-13 different sites to find the best offer, but I just found this company that compares all the buyback companies in one spot, it’s called RecomHub. It’s like Kayak but for electronic devices that show you all the offers in one spot.